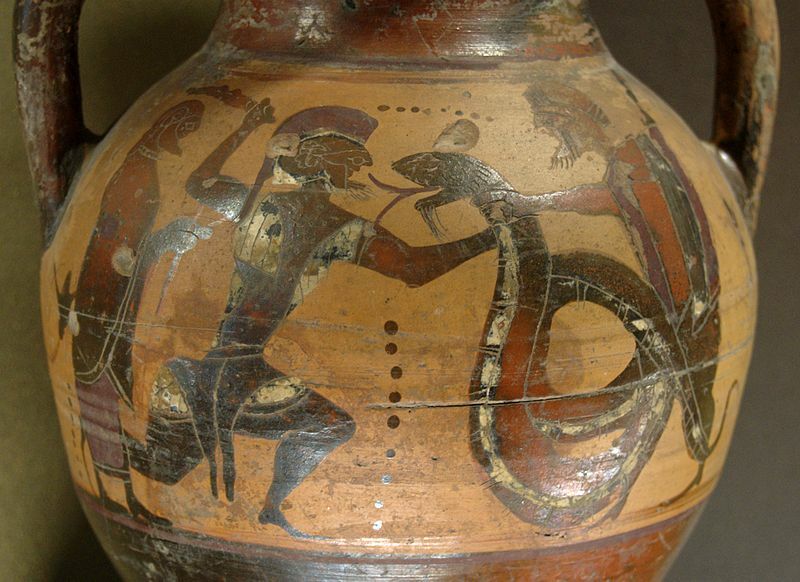 Ancient Greek amphora showing the hero Cadmus fighting a dragon. Earth is home to millions of animal species, all of which have unique features and are fascinating in their own way. And yet humans have found the need to invent new creatures to explain strange things or keep their storytelling interesting. This week, we look at the origins of 4 ancient mythical creatures, and some real animals that might be able to do similar things. 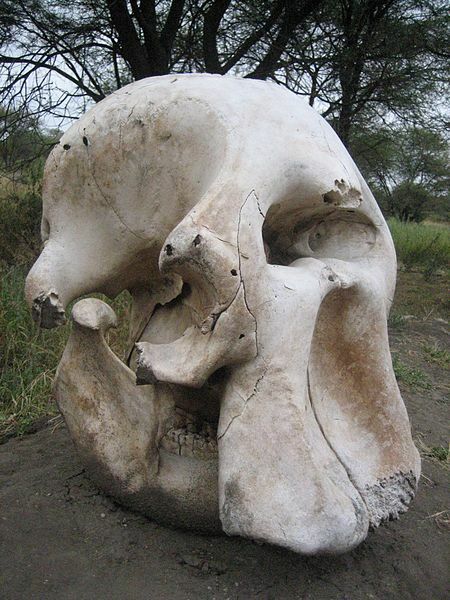 If you had never seen or heard of an elephant, but you came across a skull that looked like this, what would you conclude about the skull’s owner? If you’re like the ancient Greeks and Romans, you would probably think that the big hole in the middle was an eye socket, and that the creature had one giant eye in the middle of its face. We know today that the big hole is where the muscle and nerves and tissue of the elephant’s trunk attach to the head, but it’s easy to see why people would think otherwise. There were also occasions when the ancient Greeks would discover what appeared to be gigantic humanoid skeletons with these “one-eyed” skulls, and quite reasonably conclude that these were buried cyclopes. However, these burial sites were probably left over from when earlier peoples found large animal bones, thought they were oversized human bones (maybe belonging to a demigod hero? ), and arranged them and buried them accordingly. Illustration from The History of Four-Footed Beasts and Serpents by Edward Topsell. The concept of the unicorn has changed a lot since its inception. Today, we think of basically just a horse with a horn. But Pliny the Elder, a Roman naturalist, described them as having “the body of a horse, the head of a stag, the feet of an elephant, the tail of a boar, and a single black horn three feet long in the middle of its forehead. Its cry is a deep bellow.” When we consider all of these pieces – particularly the elephant feet and boar tail – we might come up with something more along the lines of a rhino. Rhinos are pretty unusual looking, and trying to describe them to people who had never seen or heard of such an animal likely resulted in tales of unicorns. Antelopes probably also contributed to the stories, especially those that only had one horn due to genetic defects or breaking one off. The oryx in particular was associated with a lot of unicorn stories. 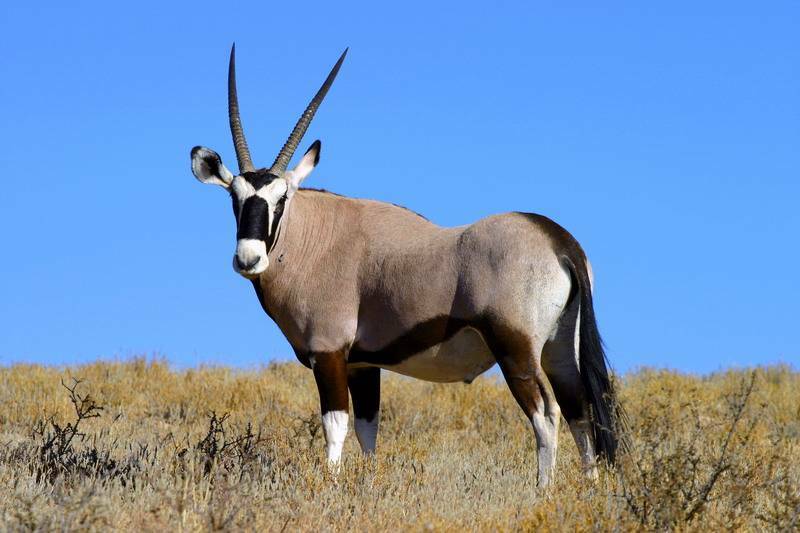 An oryx missing a horn seen from a distance could be mistaken for a unicorn. Image by Arno Meintjes. 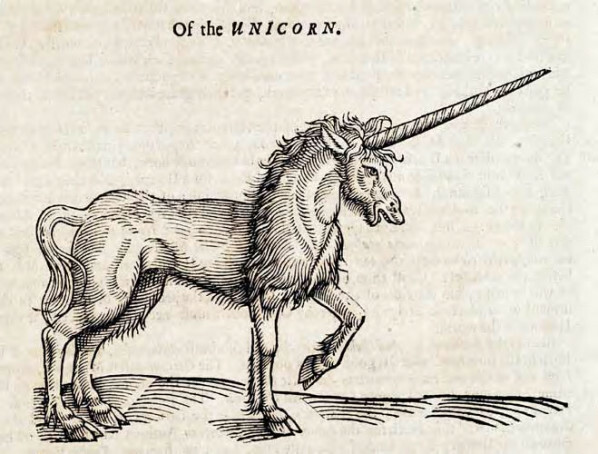 As legends of unicorns became more and more popular in European culture, people went to enormous lengths to get hold of their horns, which were thought to have healing properties. The horns of oryxes and other antelopes were frequently sold as unicorn horns, as were narwhal tusks. The narwhal has a specialized tooth that grows out through the upper lip and forms a long, straight spiraling horn, which a person unfamiliar with narwhals could easily mistake for a unicorn’s horn. Narwhals are often nicknamed "unicorns of the sea". Image by Paul Nicklen, via WWF. Illustration of an oarfish that washed ashore in Burmuda in 1860, from Monsters of the Sea by R. Ellis. You know those drawings of giant snake-like creatures on the oceans of old timey maps? We don’t know that much about ocean life now, and we knew even less when sailing ships were the primary mode of long-distance travel. So it’s entirely possible that there is some sort of dangerous sea serpent out there. However, the animal that probably inspired those illustrations is quite harmless to humans, although definitely not the most aesthetically pleasing. The ribbon-like giant oarfish is the world’s longest bony fish, reaching lengths of 11 meters (36 feet), with one unconfirmed report of a specimen that was 17 meters long (56 feet). They’re pretty common and can be found around the world, so it’s not that much of a stretch to assume that sailors might have seen them and exaggerated to create tales of giant sea serpents. This 7 meter (23 foot) oarfish was found by U.S. servicemen in 1996. Image from the US Navy. Beached giant squid, 1954. Image from NTNU. Just as a side note, it’s also worth mentioning another famous sea creature of legend – the kraken. Sailors would occasionally report seeing enormous terrifying tentacled beasts at sea, and whalers would often find tentacle marks on sperm whales. As it turns out, the “kraken” is real – sort of. Giant squids and colossal squids certainly exist and have been caught and studied, but even as big as they are, they would not be capable of (or interested in) dragging down ships to their watery graves. The Welsh flag. Wales is one of many places around the world to have a fascination with dragons. Perhaps the best-known fictional creature of them all is the dragon, the fire-breathing staple of fantasy and myth. Mythical creatures tend to be fairly localized, but dragons are unique in that cultures all over the world came up with eerily similar concepts separately from each other. Stories of dragon-like creatures come from the south Pacific to Scandinavia to east Asia, and while they vary in number of limbs, flight ability, and intelligence, they pretty much all describe large reptilian predatory creatures that can wreak havoc and can often breathe fire. So how did all of these cultures come up with this specific concept? If you had never heard of dinosaurs, it would be easy to mistake this for a dragon skull. Image by Steve Jurvetson. Anthropologists theorize that the basic layout of the dragon draws on 3 types of real predators that early humans and pre-human ancestors had to face: snakes (reptilian), birds of prey (flight, claws), and big cats (claws and teeth). In some regions of the world, crocodiles probably also played a role. We used our big, creative brains to imagine a deadly and giant combination of these threats, and occasional discoveries of what we now know are dinosaur and ancient whale bones (particularly in China) helped confirm those ideas. As for the fire breathing, that’s pretty much just embellishment – extra details to make dragons even more terrifying and exciting. As far as we know, no animal is or has ever been able to breathe fire. However, there is a group of insects collectively known as bombardier beetles that, when threatened, can shoot a burning chemical cocktail out of their abdomens at high velocity. So unfortunately you won’t be able to find fantasy-style dragons out in the wild. But you can find snakes, lizards, crocodilians, eagles, all manner of wild cats, and bombardier beetles (and of course, Komodo dragons).